I've written several posts on things I love, particularly in Germany (examples here and here). Now for something here I not only don't love – I hate it. The Bavarian education system starting with 4th grade. To be fair, the school system is considered very successful. 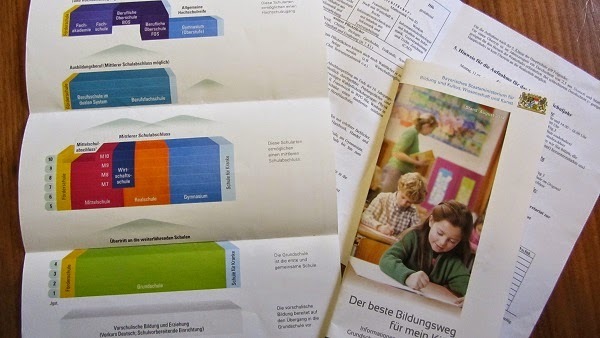 Standardized tests show that Bavarian students are stronger than in other the German states, and even internationally. Enough coolness. Onto the structure of the education system. Children go to elementary school through 4th grade. During 4th grade, when the kid is 9-10 years old, a decision is made based on grades and personality regarding which path of education suits them. -Realschule = the "middle" option which can lead to higher education or vocational school, depending on classes taken and further education after approximately ninth grade. Proponents of this school system say each school is tailored to the students' needs and that it is possible to switch tracks if necessary. But the truth of the matter is that an initial decision about whether a student will go to college is made by the time they are ten years old. What if the child had a bad year? An illness? Lost a beloved grandparent? Or had an inexperienced or burned out teacher? How can anyone think that a child's performance at age ten can accurately reflect their potential a decade down the road? Every time I'm reminded of this pigeon-holing, my pulse races. My American-ness raises its hackles. Where is the equality in a system like this? And how can you expect to breed tolerance when you're segregated at this age and don't get to know anyone not like you? My daughter is currently in 4th grade. Academically, she's doing fine. But she's faced with the fear of her best friends being torn away to the three different schools. And with her classmates' fears that they'll let down parents who pressure them to make the cut. I've even heard of some classmates who are betting money on which 4th graders will make it into which schools. Cue maternal instincts ready to erupt like a volcano. I've heard in some other areas of Germany, the school system is moving more towards one inclusionary school with different types of classes offered for the different levels required. If any of my readers have children in schools like that, I'd love to hear what they think of them. While I know that friends and family have made it through the Bavarian school system just fine, I can't help but think there must be a better way. 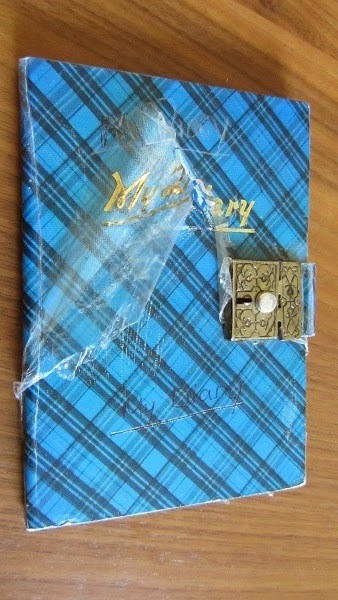 When I was nine years old, my parents bought me a diary for my birthday. Considering how much I've always loved to write, I was pretty terrible at keeping up with it. There are only about two dozen entries from the time I was nine until I turned seventeen. Doug H. acted up in class until my best friend Nikki was moved away so he could sit next to me, and I could be a good influence on him. Or "We went to the movies, and then we went shopping, and I felt like a mother because I had to hold Jenny's coat." New Year's Eve: "We had a party, and I roller skated until 1:00 in the morning." One month later, "My brother left the ice cream scoop in the ice cream and it froze shut." ->Clearly, this was a tragedy. 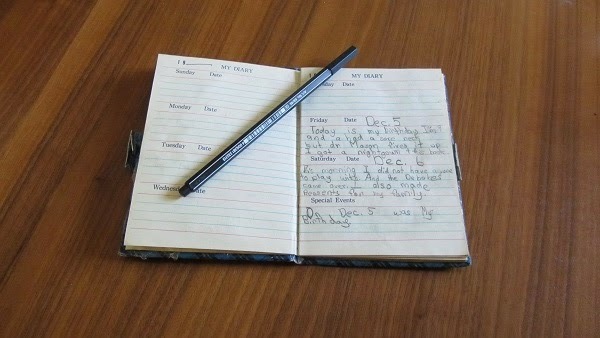 On my eleventh birthday: "Today, I got a slip, a role of tape and three pair of socks. I think they were dumb presents." -> Let that be a lesson to parents everywhere. Later that week: "Jon D. called me a Freaky French Fry, and I called him a Scaredy Carrot because he thinks he's so hot, but he really is a squirt." Looks like I lived in a war zone, doesn't it? Two years later, there's a massively crossed-out section with the phrase: "If anyone reads this, I WILL KILL THEM." Unfortunately, I can no longer make out the words under all that ink. Despite the potential death penalty, I've tried. And then, when I was twelve: "Mom stopped smoking." My mom was one of those people who had smoked since she was a teen. Stopping was really hard for her, and I remember being proud that she managed it. Nine months later: "Mom started smoking again." My mom tried to quit smoking on and off most of her life. She passed away in 2010. Cancer. Stupid cigarettes. When I was seventeen, I had a Creative Writing teacher who was very enthusiastic about my writing. I wanted to loan him some books I loved. My sister said, "That is very nerdy." The teacher ended up having a heart attack and not coming back to school, so I never did. Winning two Big Macs and a Coke at McDonalds. Some things I remember vividly. Others I don't. I'm not the same person as I was then. That's just fine with me.